New York-based Tonka Beans (www.tonkabeans.com) is changing the way women look at money matters by creating informational videos that demystify and simplify the needlessly complicated world of personal money management. Tonka Beans’ entertaining segments provide insight into women’s views on money issues. Through interviews and profiles, the videos expose women’s money-related concerns while also educating and putting into practice sound financial planning principles. The videos simplify money matters and make them relevant to the needs of women. They are available from the company’s website and through various Internet video websites. Tonka Beans’ website is also a social networking platform where women can share their personal money-related stories and get advice and opinions from registered “Opinion Makers” within a safe, women-focused environment. Zina Spezakis, CEO of Tonka Beans says that: “Statistics show that about 1 in 10 women actively invests. That critical fact combined with current social trends like high divorce rates becomes alarming when you think about how many women will retire 30 years from now. . .” Adds Spezakis: “More than ever, it’s critical that women buy into the fact that they need to become more savvy with their money. The average woman finds investing information intimidating or uninteresting. That needs to change. Personal money-management information, like any good product, has to be relevant to its audience. It’s up to us finance insiders to make that information accessible and relevant to women.” Mrs. Spezakis concludes: “We (women) have come a long way in terms of salary equity. Now that we make it, we have to learn to manage it. . .” Tonka Beans is a New York-based online creator, aggregator and distributor of investing information for women ages 23-45. This fall American coffee cup tippers will be breaking new “grounds” by changing their normal morning show routine–and checking out the newly revamped The Balancing Act. Women who want a fast-paced half-hour of news you can use, and endless entertainment will be looking to The Balancing Act on Lifetime Television for their daily dose of trends and tips–featuring advice from the country’s leading experts. Kay Renz Public Relations will be guiding the producers on exciting ways to garner the attention of women across the country as the show kicks off the new season on August 24th with two engaging new hosts, Beth Troutman and Kristi Villa, and a sleek new set. “Women are looking for a new show to wake up with, and The Balancing Act really speaks to their issues,” says Kay Renz. “Each show offers segments women will enjoy and learn from–it’s real advice that will help them and their families every day! And the new hosts will become every woman’s new best friends! They are bright, funny, energetic and they get it! They’re women. They know the struggle it is to keep the balance between all of a woman’s multiple roles.” Some of the hot topics the show will be addressing include the possible dangers of sugar substitutes, celebrity style tips with JoJo Cohen, back-to-school tips and tricks, healthy snack ideas, and an October salute to cancer survivors. Looking for some inspiration? Check out Mary Lou Quinlan’s blog on More.com regarding her “summer with breast cancer.” Such an uplifting story to share. Believing sensitive skin care has no boundaries, Kimberly-Clark Corporation is introducing improved Cottonelle Aloe & E toilet paper and new Cottonelle SoothingClean flushable moist wipes. These extra gentle products offer a combined solution that help make it easy for consumers to care for sensitive skin in their most sensitive spots. “Sensitive skin is a big concern for many consumers. Some 67 percent of women claim to have sensitive skin, and 40 percent of adult consumers report ‘minor skin irritation down there’,” said Courtney De Salvatore, brand manager. “Cottonelle Aloe & E toilet paper and Cottonelle SoothingClean flushable moist wipes help make caring for sensitive skin on bottoms an easy part of users’ daily personal care routine.” To help educate consumers about sensitive skin care – in a gentle, cheeky way – the Cottonelle brand has established the Cottonelle Institute of Sensitive Skincare online at www.cottonelleinstitute.com. The informational website, hosted by the iconic Cottonelle puppy, helps visitors discover their individual sensitive skin types – and how to care for them – through interactive labs, tips and activities. Gaiam, Inc., a distributor of lifestyle media and fitness accessories, recently announced that it will produce Losing It and Keeping Fit, a fitness DVD featuring Valerie Bertinelli and her personal trainer, Christopher Lane. Complementing her successful weight loss with Jenny Craig, Valerie achieved her newly toned and fit body working out with Christopher in her living room. She will share that experience and the exercise routine in her DVD. “We have all been so inspired by Valerie’s success with the Jenny Craig weight loss plan and now it’s exciting to be able to share the fitness regimen that has contributed to her total transformation,” said William Sondheim, president of entertainment and worldwide distribution for Gaiam. “Valerie shows us how vital proper diet and a personal exercise plan are to overall well-being.” The DVD will launch on November 3, 2009. Additionally, Gaiam will release a special Jenny Craig version of the DVD exclusively through Jenny Craig weight loss centers, on October 6, 2009. This Jenny Craig version will feature exclusive bonus footage. “Having the blessing of Jenny Craig on the DVD is an added boon for us and added value for the consumer,” said Sondheim. The Jenny Craig logo will appear on the packaging of the first video and a promotional coupon for a 30-Day Free Trial will be included inside the DVD for general retail release. 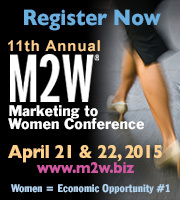 Dennis Syracuse, formerly of Sony Retail and a past speaker at M2W®-The Marketing To Women Conference, has been appointed Senior Vice President of Marketing Analytics for Datran Media, a digital marketing technology company. In this role, Syracuse will establish a Marketing Analytics Consulting Practice which will provide professional consulting services to agencies. The new Practice will broaden Datran Media’s brand advertising services to provide intelligent optimization capabilities for marketing campaigns across all digital channels.